Sting | News | Sting's "Deep In The Meadow (Lullaby)" for The Hunger Games: Songs From District 12 And Beyond is available NOW! The track is available as a free download for fans that purchase the album (www.thehungergamesmovie.com/lullaby) and can also be purchased as a single. "Lullaby" is a centerpiece of The Hunger Games, and Sting delivers a powerful and poetic rendition of the song, which was produced by T-Bone Burnett. The pair last collaborated on 2003's "You Will Be My Ain' True Love" for the film, Cold Mountain. The song was subsequently nominated for an Academy Award, a Grammy Award and a Golden Globe. 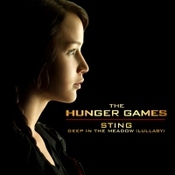 The chart-topping companion album to the film THE HUNGER GAMES, "THE HUNGER GAMES": SONGS FROM DISTRICT 12 AND BEYOND, will unlock a free download of 'Deep in the Meadow (Lullaby)' performed by Sting beginning March 27, 2012. The track can also be purchased as a single from major digital retailers. 'Lullaby' remains a centerpiece of THE HUNGER GAMES.